Heating, Ventilation Air-conditioning and Refrigeration (HVACR) market in the South East Asia (SEA) market is primarily driven by the growth in the construction sector. Leading manufacturers in the HVACR industry are tapping this market by introducing cost effective, energy efficient products in the region. The demand of regulating temperature expanded from industries to large commercial buildings and household applications. The three central functions of heating, ventilating, and air conditioning are interrelated, proving to be a necessity rather than a luxury in most parts of the world, especially in the Southeast Asia region. 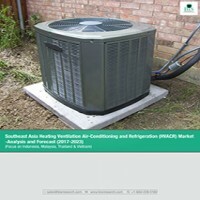 This study includes an overview and analysis of the SEA Heating, Ventilation Air-conditioning and Refrigeration (HVACR) market, by type of products and components across various countries in SEA, allowing the researcher to develop a comprehensive outlook of the market. The report provides an extensive insight into various forms of developments, trends, and key participants. While highlighting the key driving and restraining forces for this dynamic market, the report also provides an in-depth analysis of the Porter’s five forces model of the HVACR market and an assessment of the factors governing it. The report builds itself upon an all-inclusive value chain providing a clear understanding of the ecosystem of the HVACR products market. • What are major types of HVACR products prevalent in Southeast Asia region? • Who are the major players in Southeast Asia HVAC market and their respective company profile? • What are the key market developments and strategies of leading players in Southeast Asia HVACR market? • What are major drivers, challenges and opportunities for Southeast Asia HVACR market? • What is the market size (value and volume) of window and portable/moveable air Conditioners in major countries across Southeast Asia region? • What is the market size (value and volume) of mini split systems in different countries across Southeast Asia region? • What is the market size (value and volume) of single packed systems in different countries across Southeast Asia region? • What is the market size (value and volume) of chillers in Southeast Asia HVACR market? • What is the market size (value and volume) of AHU and FCU in different countries across Southeast Asia region? • What is the market size (value) of refrigeration cycle components across different products? The report includes the profiles of major players such as Carrier, Trane, Johnson controls, Daikin, among others in the SEA HVACR market, allowing the readers to gain an insight into the various industry trends in this region. 6.2 Gree Electric Appliances inc. Heating, Ventilation, Air Conditioning and Refrigeration (HVACR) has a strong growth in the South East Asia (SEA) market majorly because of the growing construction sector. The market is expected to grow at a CAGR of 9.30% during the forecast period (2017-2023). The HVAC market started gaining popularity in the early 20th century and has shown a promising growth ever since. However, the late 20th century brought a stagnation in the growth of the market. Nevertheless, the Air Conditioning (AC) market regained its momentum after the settlement of the global economic recession in 2008. The SEA HVACR market is currently exhibiting a paradigm shift towards adopting the latest technologies and environment friendly cooling solutions such as Variable Refrigerant Flow (VRF). Different regulatory, energy and other standards across SEA region (such as Montreal Protocol, National Energy Policy and Voluntary Commercial energy Codes, Energy conservation promotion act in Thailand, among others) are the major reasons why manufacturers are actively adopting more advanced cooling technologies. The market value generated by the HVACR volume sales in the SEA region varies highly, as this is a very price sensitive market. Products with higher brand name, quality, energy efficiency, and good output are sustaining the higher market share. There are several Chinese, and other regional and local brands, that are holding a significant market share on the basis of lesser pricing but with lower quality products. The leading players are focusing on increasing their market presence in this region by expanding distribution outlets in the region and launching products specifically designed for the local population. Furthermore, the regulatory bodies existing in this region play a crucial role in determining the market for the HVACR products. The HVACR products market has evolved from the stages of rapid growth, then reaching towards stagnation, and subsequently gaining momentum again. The dynamic nature of the industry can largely be attributed to the increasing urbanization, unprecedented population growth in the SEA region, and frequently modifying governmental regulations for making the HVACR products more energy efficient, among others. The major players in this region such as Mitsubishi Electric, Dakin, Carrier, among others have focussed on developing innovative and energy efficient products to tap this opportunity in the market. Also, the companies have laid major emphasis on growing their sales and distribution network in this region to further increase their market share.